The Skoda Kodiaq SUV has made its public debut at the Paris motor show. The new model will lead an eventual five-strong crossover line-up that the Czech firm plans to use as a springboard for growth in Europe and potentially the US. In the UK, it is tipped to start from a remarkable £22,500 - undercutting all of its direct opposition. The Kodiaq will hit the road in early 2017. Within three years, it is expected that a coupé version of the Kodiaq will have been launched, the ageing Skoda Yeti will have been renewed and a smaller Skoda crossover to rival the Nissan Juke will also be on sale. Additionally, a budget SUV for China only is being developed. 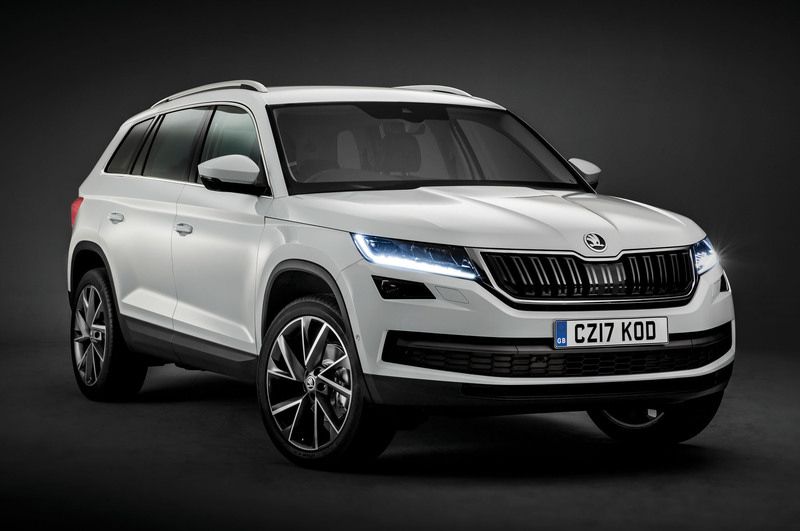 Although Skoda officials would not confirm these details, at the Kodiaq launch event CEO Bernhard Maier described the Kodiaq as being “at the forefront of Skoda’s extensive SUV campaign”. He added: "I can't tell you every detail yet, but there are numerous ideas that we want to develop. The new Yeti is coming, the Kodiaq coupé is underway and then there are other opportunities. With global SUV sales rising by 23% in the first three months of 2016, according to analysts JATO, Skoda’s planned launches signal its intent to chase significant volume growth around the world. In 2015, Skoda accounted for 4.34% of all European car sales - up from 2.73% in 2005. 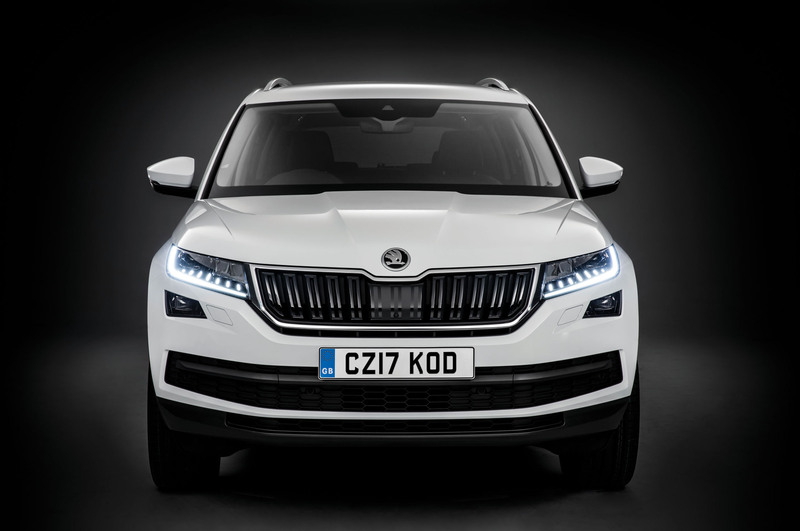 Growth in recent years has been largely focused on the European market, although Skoda does build cars for key markets such as China, Russia and India - and the Kodiaq coupé is currently planned to be sold in China only, unless there is sufficient global demand. Kodiaq pricing is being revealed at the Paris motor show. Sources suggest an entry-level model will be priced closely to the equivalent Skoda Superb at around £22,500, with mid-spec cars starting from £26,500, and the top-end model with the seven-seat option rising to over £35,000. If confirmed, those figures substantially undercut the pricing of rivals such as the Nissan X-Trail, Kia Sorento and Hyundai Santa Fe. Skoda officials say they have had more expressions of interest in the Kodiaq pre-launch than any other car in the firm’s history, although order books won’t officially open until the end of 2016. The first Kodiaqs are expected to hit UK roads in April 2017. The Kodiaq is based on the Volkswagen Group’s modular MQB platform and is 4697mm long, 1882mm wide and 1676mm tall when fitted with roof rails. Although that is par for the class - and just 40mm longer than an Octavia - Skoda says the Kodiaq will beat its rivals because it has better interior space and more technology and offers more value for money. Additionally, it will have the option of seven seats - making it Skoda’s first seven-seater - and a seats-down boot capacity of up to 2065 litres (720 litres seats up), which, its maker says, is the largest available on the market. The X-Trail’s boot capacity is 1982 litres, which is, in turn, significantly greater than that of other close rivals. 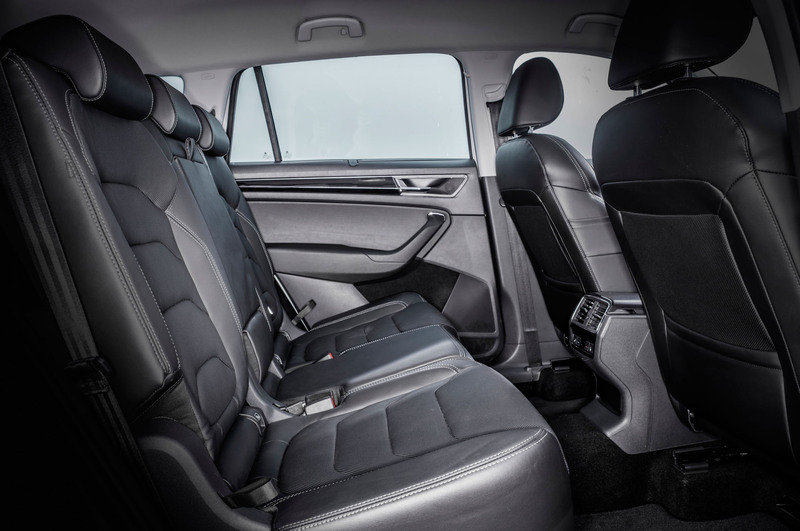 Skoda highlights the second-row seating system as an example of the detail it has gone to in order to make the Kodiaq as practical as possible. The seats split 60/40, they move lengthways by 18cm and the backrests are individually adjustable as standard. Buyers can also spec a folding front passenger seat, which enables the Kodiaq to carry items up to 2.8 metres long, and an electrically operated tailgate that can be operated by waving a foot under the rear of the car is available as an option. When fitted with a diesel engine, DSG gearbox and four-wheel drive, the Kodiaq’s maximum towing capacity is 2.5 tonnes. The Kodiaq will be launched with a five-strong engine range and three trim levels, expected to be called S, SE and SE-L in the UK when specs are confirmed in late September 2016. Wheel sizes will range from 17in to 19in. Two diesel engines and three petrols will be offered initially. Both diesels are 2.0-litre units. The entry-level diesel produces 148bhp and 251lb ft of torque, and the more powerful engine 187bhp and 295lb ft. Skoda has released only select details, saying the entry-level unit officially averages 56.5mpg and emits 131g/km of CO2, and the more powerful diesel covers 0-62mph in 8.6sec and has a top speed of 130mph. There are two 1.4-litre petrol engines and one 2.0-litre petrol. The entry-level engine produces 123bhp and 148lb ft of torque and averages 47.0mpg while emitting 140g/km of CO2. The more powerful 1.4-litre engine, which features fuel-saving active cylinder technology, has 148bhp and 184lb ft of torque. The 2.0-litre petrol engine has 178bhp and 236lb ft of torque. Buyers can choose between a six-speed manual gearbox or DSG semi-automatic gearboxes with six or seven speeds. The most powerful petrol and diesel engines can be coupled with only the seven-speed DSG gearbox and all-wheel drive. Gearbox options for other engines depend heavily on whether the buyer specifies four or front-wheel drive - with the option of either available on all but the smallest petrol engine. DSG-equipped cars will have the option of Driving Mode Select, which allows the driver to toggle between Normal, Eco, Sport, Snow and Individual modes, all of which alter the DSG, engine, power steering and air-con settings. Additionally, Adaptive Dynamic Chassis Control can be integrated with the system, adjusting the shock absorber settings in line with the selection of Comfort, Normal or Sport mode. The Kodiaq also has an Off-Road mode, which modifies the chassis, engine and brake settings to cope with rough terrain and engages Hill Descent Assist on steep downward slopes. Early indications are that the Kodiaq will be priced to significantly undercut rivals at every level. A top-end Laurin & Klement trim level is expected to be launched around the end of 2017. The Kodiaq’s styling is heavily influenced by the VisionS concept car shown earlier this year, with the interior in particular featuring several striking new design touches. As standard, the Kodiaq gets a 6.5in touchscreen as standard, with Bluetooth and SmartLink, which supports Apple CarPlay, Android Auto and MirrorLink, available as options. Optionally, buyers can have an 8.0in touchscreen, which includes a function that records the driver’s voice and plays it back to the rear seats. A top-spec system adds a sat-nav function to the 8.0in screen, plus off-road and parking camera aids. A 64GB flash memory and DVD drive are also available and a WLAN wi-fi hotspot is optional. Integrated tablet holders in the rear of the front seats and a wireless smartphone charging pad can also be specified. Although exact specifications have yet to be set, standard safety kit levels are expected to be high. Additional driver assistance systems will be offered as options or as part of a bundled safety pack. These are expected to include new functions to Skoda such as Area View, which displays a full bird’s-eye view of the car while manoeuvring, Manoeuvre Assist, which automatically brakes the car if an obstacle is detected while reversing, and Tow Assist, which will steer the vehicle and trailer in slow-speed reversing manoeuvres. Buyers can also specify more advanced, semi-autonomous functions such as Emergency Assist, which works on models equipped with a DSG gearbox and automatically brings the car to a halt safely if it detects the driver is no longer able to drive. Crew Protect Assist, meanwhile, closes the windows and sunroof and pre-tensions the seatbelts if it detects an imminent accident. Multi-Collison Brake is standard and reduces movement of the car following an accident. Standard safety kit will include City Emergency Brake, which stops the car if a likely impact is detected at up to 21mph, and can be upgraded to include a Predictive Pedestrian Protection system, which monitors a greater variety of situations. Adaptive Cruise Control (ACC), Lane Assist, Blind Spot Detect and Rear Traffic Alert are also standard. Cars fitted with Lane Assist, ACC and a DSG can have Traffic Jam Assist, which will maintain the Kodiaq’s speed in what Skoda calls “slow-moving traffic” and automatically brake it to a standstill if necessary. Traffic Assist with Traffic Sign Recognition will display speed limits and road signs on the in-car computer and sat-nav system. Under the umbrella name of Skoda Connect, the Kodiaq is equipped with two constantly online systems: Infotainment Online and Care Connect. 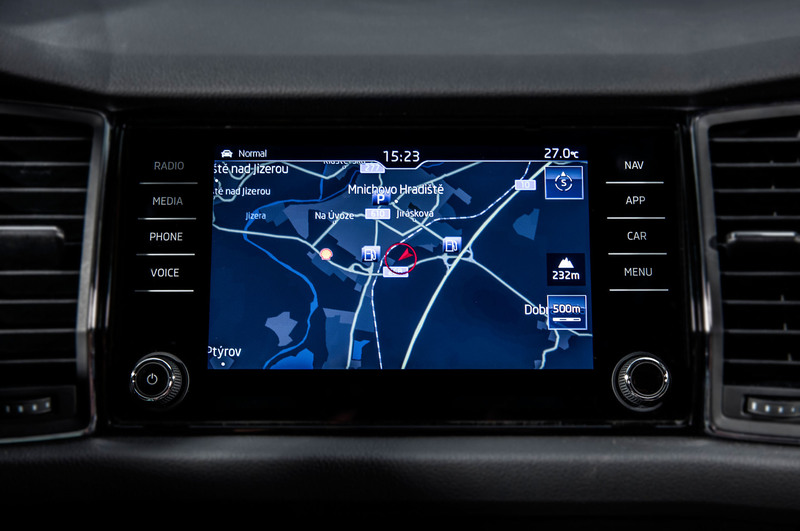 Infotainment Online includes live traffic information, Google Earth and Street View mapping and live information such as fuel prices, parking information and news and weather updates. These are free for the first year, but buyers must pay a subscription charge - yet to be revealed - thereafter. Care Connect includes an Emergency Call function, which sends a direct message to the emergency services when a restraint system is deployed. The system also monitors the car’s data and automatically contacts a garage with details of servicing work required prior to arrival. Additionally, Skoda is offering buyers two apps: Skoda Connect allows them to monitor the Kodiaq’s movements while away from the car, including setting up alerts for speeding or the car being driven when it should be parked; and SmartLink combines sat-nav data, music and news information, plus details of the car’s data. Skoda have been clever to unveil this bloater in a darkened room. It helps to hide some of the excess fat - and there is a lot of it. Perhaps its overweight owners will empathise? The space and value proposition of Skoda will really make sense in the USA. It isn't just the Kodiak that will sell there. VW and SEAT make less sense. If I were VWAG I would just rebadge Skoda's as VW's and replace the whole VW range. I'd keep halo stuff like the Golf R as a stand alone model. And then how would you deal with the fall in sales, collapse in revenue, plant closures, mass redundancies and shareholder revolt? I bet vw can't believe how successful skoda has become, although I think it might shortly if it isn't already going to cause them a problem. Skoda is no longer a joke so why exactly would you buy a vw over a skoda? Because VW's have higher material quality, use more expensive components resulting in better ride and handling, are more refined to name a few reasons. Ditto again for Audi. I for one would never buy a Skoda precisely for the above reasons. For me the best balance between price and engineering / material quality is struck by VW or Audi. Because VW's have higher material quality, use more expensive components resulting in better ride and handling, are more refined to name a few reasons. winniethewoo is not that far of the mark. I recently compared an Octavia and Golf (both 1.4 TSI petrol models). The Golf was quieter, smoother riding and with sharper handling. The Skoda has a simple torsion beam rear suspension whereas the Golf has a multi link fully independent rear end and it makes a noticeable difference. Yes, you still get the torsion bar rear end on the 1.2 and 1.6 diesel Golf bit on the Octavia you only get independent rear suspension on the 4x4 models. Having said that, I owned a Yeti for a couple of years and would happily buy another Skoda, maybe one of these Kodiaks, but I have to say that I am ever so slightly underwhelmed by it. I'll have to drive one. I would say I am bang on the money. I test drove Octavia, Golf and A3 before settling on the Golf. For me the Golf edged it in the VFM department. The Skoda was a fair bit noiser, had noticeably worse body control, didn't handle with the same precision, and had worse seats. The A3 was slicker had nicer materials and rode better but to me wasn't worth the price premium. There is a reason why the Golf is consistently Europes best selling car. In certain specs, the Golf is more expensive than the equivalent A3, and I notice the Seat Leon is not on your list, why is that?